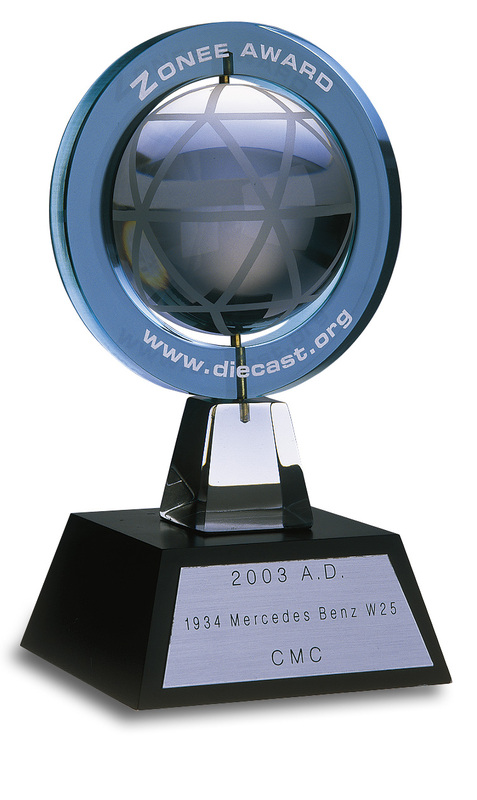 Daimler-Benz´ re-entry into the Grand-Prix sports took place in 1934. Manfred von Brauchitsch participated with the completely new developed Mercedes W25A in June 1934 at the Nürburgring for the first time. Straightaway this new car was able to win the international Eifel race. This event became known as the birthplace of the “Silver Arrows”. 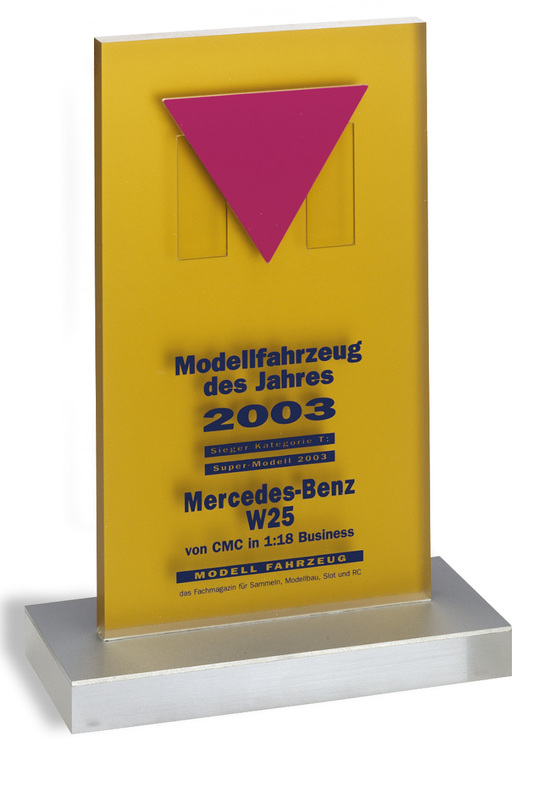 CMC recreated the victorious car with starting number 20 as an extraordinary collectors item in every detail. After several years of absence, Daimler-Benz decided to return to the Grand Prix races in 1934, aspiring to put its brand back into the public spotlight once again. A new Grand Prix regulation, however, was being enforced that allowed only cars weighting 750 kg or less to participate. Mercedes’ answer to the regulation change was the type W25. It was a sleek and aerodynamically-shaped car with an overhanging headrest and a sidewise-installed exhaust manifold. recovered from injuries sustained prior to the race. As a result, the young daredevil, Manfred von Brauchitsch was given the chance to prove himself. Before the race started, however, Mercedes encountered a serious problem at the car approval office. The W25s weighed 1 kg too heavy according to the new regulations. To reduce the weight, the team worked overnight to sand off all the white paint, thus revealing the shiny aluminum body underneath. 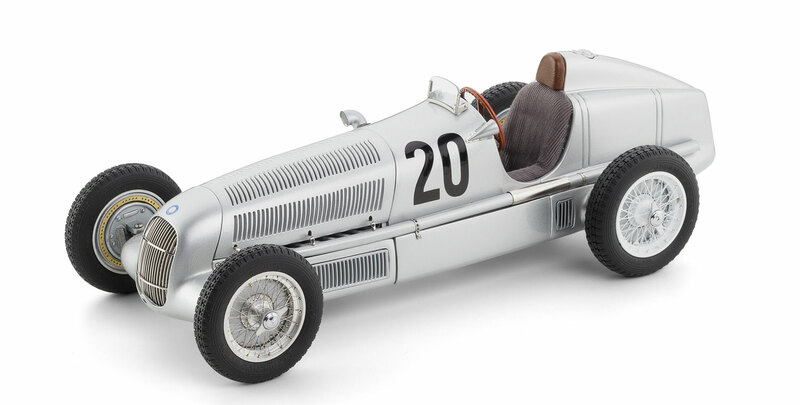 This new appearance and subsequent success of the car gave rise to the legend of the “Silver Arrows”. With starting number 20, Manfred von Brauchitsch crossed the finishing line as the victor of a thrilling race. Hans Stuck came 2nd on an Auto Union, whereas Louis Chiron finished 3rd on an Alfa Romeo.